We’ve added the 2010 aerial photographs to NYCityMap. Now you can view aerial photography from 1924, 1951, 1996, 2006, 2008, and 2010. 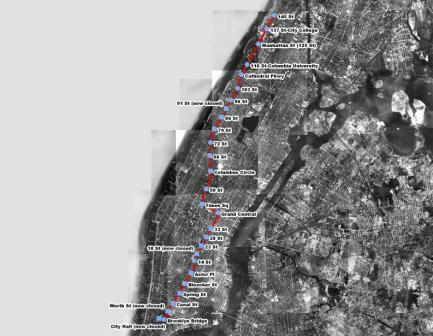 In these screenshots you can see the difference from 2008 to 2010 in the area of the Brooklyn Bridge Park. The Food Retail Expansion to Support Health (FRESH) data has been updated to reflect new program areas and incentive types. FRESH provides zoning and financial incentives to promote the establishment and retention of neighborhood grocery stores in underserved communities throughout the five boroughs. You can read more about the program here. We’ve been collecting data feedback from our users since February and incorporating it into our own data whenever possible. Sometimes we have questions about what you are trying to tell us. To help with this we’ve added new name and email address fields to the data feedback form. They’re both optional, so you can choose to remain anonymous if you want to. We will contact you only if we have questions specifically related to the feedback you have provided. Contact information will not be used for any other purpose. We’ve cleaned up the look of our municipal boundary outlines. So that we can better maintain the content, we’ve moved the User Guide to this blog site instead of storing it as a PDF. Since our last release you may have encountered a couple of browser specific defects. First, in Firefox it was not possible to stop the measure tool. Normally measuring is stopped by double-clicking. Second, in Chrome, links from identify callout boxes were unclickable. Both of these issues have been fixed in this release. In order to improve performance on all of our websites we’ve contracted with a Content Delivery Network. This will help you receive all sorts of static content much faster while freeing our servers to perform the real spatial work needed to make your map.